Sophya Baccini began her musical career in 1990 as the singer in the Italian dark progressive band Presence. She has a long career in prog rock and musical theater. In 2009 Sophya released her critically acclaimed first solo album Aradia. Then in 2012 she decided to form an all female band and thus Sophya Baccini's Aradia was born. 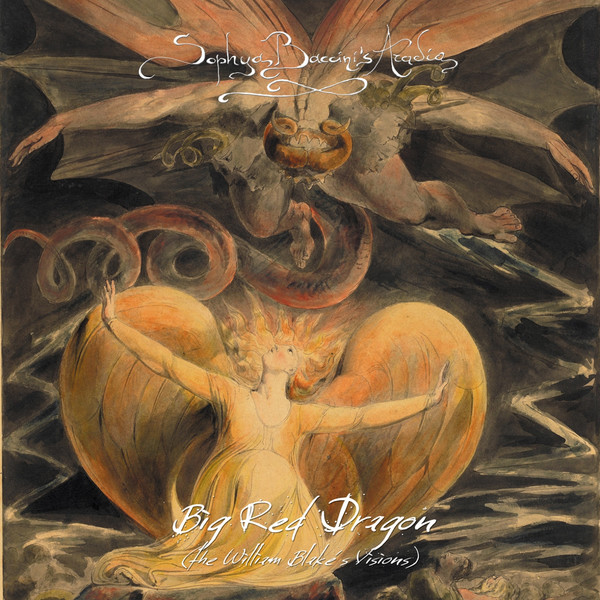 Their first release is the ambitious Big Red Dragon, a musical interpretation of William Blake’s visions. The band is Sophya Baccini (vocals, keyboards, and synth bass), Chicco Acetta (guitars), Francesca Colaps (drums), Stella Manfredi (violin and viola) and Marilena Striano (piano on “Beatrice”). And to augment the band on Big Red Dragon, Sophya enlisted some past and present prog rockers: Christian Decamps, Enrico Iglio, Pino Falgiano, Aurelio Fierro Jr., Sonja Kristina, Elisa Montaldo (Il Tempo delle Clessidre), Steve Sylvester, Roberto Tiranti, and father and son Lino and Irvin Vairetti (Osanna). This all-star cast creates some very powerful and majestic symphonic progressive rock mixed in with dark Italian progressive. Following in the wake of Fabio Zuffaniti’s recent rock operas Merlin and Rime of the Ancient Mariner, this is Italian music theater rock at its best. Chicco’s guitar chops soar through the music lending an early 80s feel to many of the tracks. Many times when someone attempts a project like this the music tends to sound the same from track to track, which is not the case here. Sophya composed unique musical interpretations of each vision and then juxtaposed them in such a way that the sum total keeps you actively engaged throughout the disc. And the closing song is a beautiful and majestic cover of Sir Hubert Parry’s hymn “Jerusalem,” also popularized by Emerson, Lake, and Parmer. Some of the highlights for me are the opening track “William,” “Satan,” “La Porta del Inferno,” and “While He’s Sleeping.” There is a lot happening musically on this disc as Sophya takes you through a range of emotions and Blake’s visions. This is certainly a highpoint in contemporary Italian progressive music!